French Cleaners is proud to be selected as an affiliate of America's Best Cleaners (ABC), a third party organization that searches out the top cleaners across the United States. As an affiliate of ABC, French Cleaners undergoes annual inspections, monthly secret shops, and random spot peer reviews to ensure that our service meets the highest standards in the garment care industry. About America's Best Cleaners. ABC is an independent certification organization dedicated to the continued excellence of the dry cleaning profession. To that end, ABC has devised and implements the toughest standards of quality in the industry. To assure dry-cleaning clients, designers, retailers, and manufacturers that they will receive the utmost professional care, ABC affiliates are inspected thoroughly and tested monthly and yearly with on-site inspections. ABC also takes surveys of retailers and clients, secret shopping reports and we listen to you, the customer to ensure the continued quality of service for all affiliates. Continuing Education and Certification. In order to maintain our certification with ABC, French Cleaners performs weekly self-monitoring of 31 individual finishing quality control inspection points on six core garment types and a maintenance check of core equipment essential to quality; monthly solvent testing to monitor the consistency and quality of the cleaning process; and annual site inspections that check for things like cleanliness, consistency, and plant function. 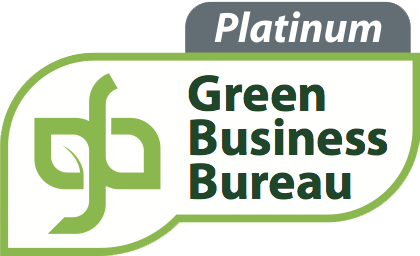 French Cleaners is the only Green Business Bureau Certified dry cleaner in the state of Connecticut, and we are determined to do our part for our community and the environment. We care about the health of our customers and employees, and use organic cleaning fluids which are non-toxic and safer for both them and the environment. In addition, we've used eco-friendly wet cleaning for years. Wet cleaning uses highly-efficient technology to monitor water and detergent use to minimize waste and protect the environment. We've also made great strides in the reduction of our energy use, helping the planet and keeping our costs down. How are we reducing our "carbon footprint" and energy use? Water reuse and heat transfer. At French Cleaners, water is used in multiple ways before going down the drain. First, cold water in sanitary lines is used to cool equipment. The water warms as the equipment cools, and this "pre-heated" water is then piped to washing equipment. This system minimizes the amount of energy needed to bring the water to the full temperatures necessary for laundering your clothes. Low-energy rotary screw air compressor. Our low-energy compressor includes electronic monitoring and is used to make the clean dry air necessary for running our dry-cleaning equipment. Lighting. We continually upgrade our lighting systems to the most energy efficient sources available, which include high efficiency fluorescent and LED lighting wherever possible. Upgraded steam traps. We use modern, state-of-the-art steam traps. This new space age steam trap technology is used to conserve on the use of steam by eliminating the chance of steam leaks due to malfunctions which are common with traditional steam traps. Hanger recycling program. At French Cleaners, we encourage our customers to return their hangers and poly plastic bags for reuse and recycling. In fact, we typically recycle 50-60% of our hangers every year, cutting costs and helping the environment at the same time. Advanced cleaning technologies. Our advanced, eco-friendly detergents and cleaning solvents allow us use lower water temperatures, which not only conserve energy, but minimize stress on fabric fibers, helping your clothes last longer, too. Space efficiency. French Cleaners has invested in professional space designing, the result of which is an energy efficient work space in which warm equipment is grouped together in an area that is cooled by evaporative cooling. This allows us to cool other working areas less expensively via air-conditioning. Route planning. We use computers to design the most efficient pickup and delivery routes, saving both fuel costs and our drivers' time. At French Cleaners, we've know that green business is good business and that we can protect the planet while protecting the bottom line. We take our commitment to the environment seriously, and strive every day to leave a healthier environment for us, our children, and our children's children. Want to see what else French Cleaners is doing to be green? Click on the Green Business Bureau seal at the bottom of this page to see a complete list of all our green activities and practices.